Darwyn Cooke DC: The New Frontier #3 Page 48 Original Art (DC, 2004). Wonder Woman's moment of triumph is cut short, in this page from the Eisner, Harvey, and Shuster Award-winning comic book limited series written and drawn by Darwyn Cooke. 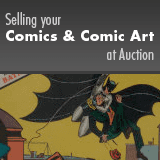 The art has an image area of 9" x 14", and it is in Excellent condition. Signed by Darwyn Cooke at the lower right.